Work has begun on the second Aptos trestle mural! Local mural artist Art Thomae was down with his paint brushes and ladder yesterday, the first day of work on a job that is likely to need months to complete. Mr. Thomae is the same artist who created the mural on northern trestle on the other side of Aptos Village last year. 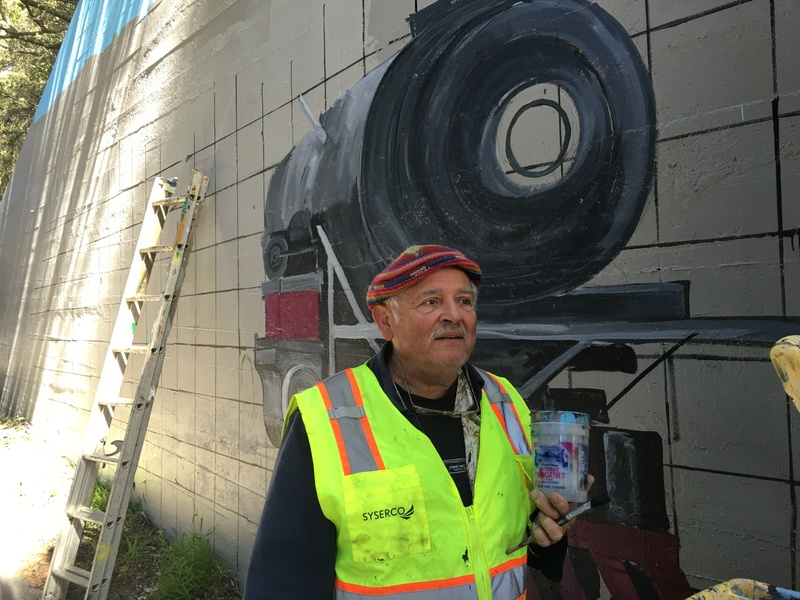 This mural will feature an iconic Baldwin steam train from the late 1800’s which used to service the various industrial operations in Aptos Village. For train aficionados, a very similar steam train can today be seen in the California State Railroad Museum. The project is not yet fully funded, and donations are still being sought! Donors are encouraged to contact Mary Russell through the Aptos Chamber. Mary can be reached at 831-566-8836 or via email at mer4000@aol.com. If you’d like to help out with the actual painting work as well, volunteers on the project are also welcome. A lot of our community members have worked hard to make this happen: Steve Allen, Mary Russell, Adele Talmadge, and John Hibble with the Aptos Chamber of Commerce and Aptos History Museum. Art Thomae also wanted to give a special and particular shout-out to Hal Turner of Turner Painting, who did a lot of work helping get the site prepared for the new mural.